When you think of broccoli, you may think of mom telling you to eat your vegetables. But broccoli isn't just for boiling and serving on the side of a main dish! If you don't identify as a broccoli lover, we're here to inspire you to think differently, with this round-up of creative recipes using broccoli that will make you reconsider just how surprisingly delicious this humble green vegetable can be. Besides being a fabulous flavor match for some of our other favorite ingredients, including cheddar cheese and bacon, broccoli is also super nutritious and an excellent source of dietary fiber, B vitamins, potassium, calcium, and iron. So eat your greens, and enjoy these tasty recipes with broccoli for breakfast, lunch, and dinner that will make you wonder why you haven't been including good old broccoli at every meal! Here's a great way to add some extra nutrition to a family favorite meal, while also adding great taste and texture. This easy, one-pan broccoli macaroni and cheese recipe is a snap to prepare, and it's cooked on the stove top using just one saucepan. It's a great way to get your kids to eat their broccoli if they don't always like vegetables. 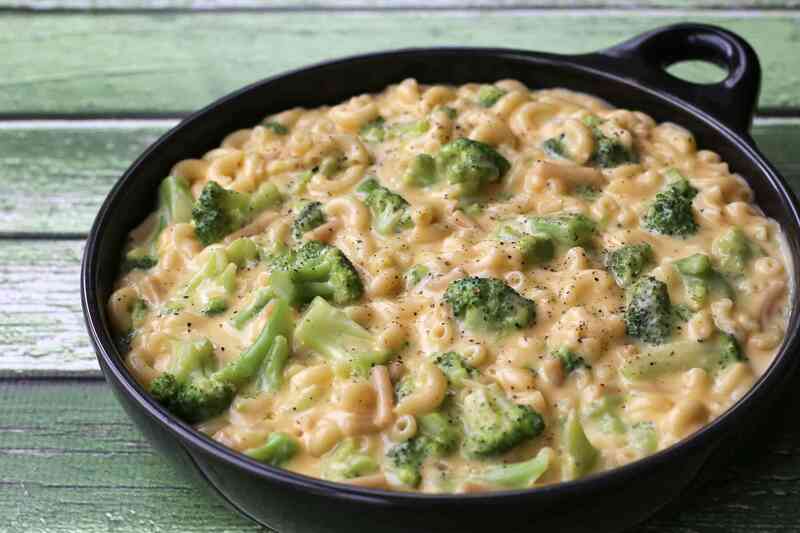 Lots of sharp Cheddar cheese paired with the broccoli gives this mac and cheese recipe amazing flavor. Quiche is always a welcome dish at brunch or lunch, and this classic broccoli and ham quiche recipe is a wonderful choice for enjoying with your family or friends anytime. Savory, salty cooked ham combines with broccoli, mushrooms, tomatoes, eggs and sharp Cheddar cheese in a colorful, delicious and filling quiche that you'll be proud to serve. This easy, one-dish broccoli walnut pasta is a great go-to recipe on busy weeknights. Toasted walnuts and Italian cheese add a welcome, savory flavor to the fresh, healthy crunch of broccoli. Make it with whole wheat pasta, for an even more nutritious family dinner. When you're craving the delicious taste of Chinese take-out food, but want to avoid the expense (and extra calories) of ordering in, we've got the perfect recipe for you. Stir fries are one of the most common types of dishes in Chinese cuisine, and this beef and broccoli stir-fry is one of the most popular recipes. In this tasty and healthy version, lean, protein-rich beef is combined with nutritious, crunchy broccoli, garlic, ginger, and a classic, savory Chinese sauce. Your family is sure to ask for second helpings! Vegan and vegetarian-friendly, filling and a delight for the tastebuds, this East Indian-inspired broccoli and potato curry recipe deserves a place in your weeknight rotation. Try this easy, authentic curry recipe when you're craving a satisfying, tasty veggie meal. Featuring broccoli and potatoes cooked in a tomato sauce with fragrant Indian spices, this dish is an excellent gluten-free and vegan dinner option when served alongside rice or any gluten-free grain such as quinoa. Delicious and easy, this roasted broccoli with ginger for a unique and craveable side dish. Plus it's roasted on a sheet pan so it's super quick to throw together and is out of the oven in no time! Kids love cheese and this creamy broccoli Cheddar soup is a great way to get your kids to eat their vegetables. Broccoli and cheddar cheese go well together in almost any recipe, and this scrumptious, comforting broccoli cheese soup is the perfect thing to make when it's cold outside, and you want something yummy to warm your tummy. This easy, crunchy easy broccoli slaw with raisins is absolutely full of flavor and texture. It's also packed with good-for-you vitamins and makes a delicious first course any time of year, no matter what's on the menu. Pre-shredded broccoli is tossed with raisins and sunflower seeds in a tangy, creamy vinaigrette dressing. Makes a great alternative to the same-old tossed salad as well. You can also add bacon for a salty, savory jolt of flavor that works beautifully with the other ingredients. Here's a great way to use up leftovers and fill your kitchen with the delicious scent of a homemade casserole. All you need for this turkey divan casserole is some cooked chicken or turkey (you can use store-bought rotisserie chicken), cooked broccoli, a little Parmesan cheese, and an easy, homemade white sauce made rich with an egg yolk and shredded Cheddar cheese. Assemble it ahead of time and pop it into the oven on weeknights when your family is craving a warm and comforting meal. Chicken and broccoli Alfredo ziti bake is a simple and elegant one-dish meal that makes a great addition to your buffet table or the main dish for family dinners. It's also super easy to prepare with store-bought Alfredo sauce, rotisserie chicken and frozen broccoli florets. Cheddar cheese is added to the creamy sauce to add a sharp and tangy flavor that wakes up the chicken and is a real crowd-pleaser. You can also easily assemble and refrigerate this casserole up to three days ahead of baking and serving, making it a fabulous make-ahead party dish. Who wants cornbread? Savory, warm cornbread is a Southern dinner table favorite. In this Mississippi version of the popular Southern side, healthy broccoli and cottage cheese are added to make this cornbread super moist, delicious and nutritious. Take this broccoli cornbread along to a potluck or for a tailgating event, and prepare to receive compliments. It also goes great with other Southern favorite foods, including beans, chili, and collard greens. This broccoli casserole with stuffing crumb topping is so easy to prepare and bake and makes a great meal for a Sunday dinner or holiday feast. Cooked broccoli is combined with condensed soup, Cheddar cheese, eggs, and savory flavoring, for a cheesy, creamy filling. Buttery stuffing crumbs are then spread over the top of the casserole, giving it an extra burst of flavor and crunch. Savory pancakes make a great starter or side dish when you're cooking for company. These tasty, savory broccoli pancakes are a versatile side dish that can be served in a stack with a fried egg on top for brunch, in place of cornbread or muffins alongside soup or stew, or topped with a dollop of herbed goat cheese or a morsel of smoked salmon for an elegant party appetizer. Ready in 20 minutes and so easy to make, you'll have plenty of time to enjoy all the compliments you get when you cook these cute and healthy pancakes. When you're looking for a brunch dish that's filling and packed with savory flavor, you can reach for this easy, cheesy, satisfying broccoli and cauliflower frittata recipe that's full of the healthy goodness broccoli and cauliflower afford. This frittata is great for breakfast and brunch, but with cooked spaghetti in the recipe, you can go ahead and enjoy it for lunch and dinner, too. It's a snap to make, and may just become a family favorite way to eat your vegetables. This chicken and broccoli recipe is a wonderful flavor match, and this easy dish -inspired by classic Chinese cuisine - is sure to become a favorite weeknight supper. Quick to prepare and cook, this chicken and broccoli recipe is full of flavor and packed with all the nutrition you may need. The recipe includes simple tips for "velveting" a chicken breast, to lock in moisture and give the meat a softer, more intense flavor. Serve this recipe on top of cooked rice or noodles, for a satisfying and healthy meal you can enjoy anytime.